We carry a full line of Fire Bricks, Pots, Round Cast Iron Pots, Rectangular Pots, Round Steel Pots, Hearth Plates, Burners, Controls, Crucibles, Base Blocks, Ball Valves, Thermocouples, Pilots, BASO Valves, Solenoid Valves, General Purpose / Gas Shut-Off Valves, Low Pressure and High Pressure Diaphragm Gauges. Recommended for combustion chambers, kilns, ovens, melters, and forges. B-23: Buzzer 2,300 degrees F insulating firebrick. Recommended for use up to 2,150 degrees F.
Our most insulating firebrick, it is also lightweight. Size 2 1/2″ x 4 1/2″ x 9″ long. B-26: Buzzer 2,600 degrees F insulating firebrick. Recommended for use up to 2,450 degrees F.
B-30: Buzzer 3,000 degrees F insulating firebrick. Recommended for use up to 2,850 degrees F.
Our hardest and densest insulating brick. Ideal for combustion chambers, bag walls, baffles, door jambs, and supports (when special sizes are required). Size 2 1/2″ x 4 1/2″ x 9″ long. BH: Buzzer Superduty 3,300 degrees F hard brick. Recommended for use up to 3,000 degrees F.
This hardbrick is rugged but not very insulating. Ideal for bag walls, target bricks, baffles, stops, door jambs, threshold, vestibule, and other areas where high temperature and resistance are required. BHS: Buzzer Superduty 3,300 degrees F hard brick split. Recommended for use up to 3,000 degrees F.
BS: Buzzer Superduty 3,300 degrees F hard brick soap. Special bricks, arch bricks, mortar (glue), and coatings are also available or can be ordered. Please call us with specifications for a quotation. Type “K” thermocouples for sensing the temperature of ovens, kilns, furnaces, forges, and other high temperature processing equipment. Type “K” sensors (2,250OF) are in stock; other grades are available upon request. Top item in photograph: standard industrial grade thermocouple with ceramic (mullite) protection tube. Can be used in a horizontal or vertical position. 12″, 18″ and 24″ long thermocouples are stocked. Also available as a duplex thermocouple (two sensors in one housing) for the use of temperature controls and high limit safety controls. 12″ duplex is stock; other lengths are available upon request. 12″ type “K” thermocouple base list price is $150. 18″ type “K” thermocouple base list price is $169. 24″ type “K” thermocouple base list price is $188. 12″ type “K” duplex thermocouple base list price is $170. Middle item in photograph: new style magnesium oxide insulated thermocouple. This industrial thermocouple will resist both oxidation and reduction atmospheres and offer high corrosion resistance. The type “K” sensor is protected by a layer of magnesium oxide insulation and an Inconel alloy 600 protection sheath (1/4″ diameter). Unit also includes an adjustable 1/2″ compression fitting. 12″ type “K” thermocouple with “plug-in” connection head – Mgo style – base list price is $175. 12″ type “K” thermocouple with cast iron “standard” connection head – Mgo style – base list price is $165. 12″ type “K” duplex thermocouple with cast iron “standard” connection head – Mgo style – base list price is $174. Bottom item in photograph: replacement 8 gauge type “K” insert. The replacement insert is tig welded on the end and includes the ceramic insulators which keep positive and negative legs apart. Used to rebuild an existing thermocouple. Other lengths available upon requests. 12″ type “K” replacement insert base list price is $37. 12″ type “K” duplex replacement insert base list price is $40. Buzzer package includes a pre-wired WatlowTM 982 ramping control. The 982 will display both the set point and current process temperature. The control can hold up to four programs, with up to six steps per program. This PID control includes “autotune” capability, one thermocouple input and two 120v outputs. Package includes 145 FM approved high limit safety control. The set point is field adjustable and is used to shut down main burner and pilots if high limit set point is reached. Control must be manually reset to turn alarm condition off. Control also includes a 24 hour x 7 day time clock. Timer has both hour and minute hands so that the time settings can be easily verified and reset. Control includes a 10 amp mechanical relay, providing an output signal to open most combustion valves or power most combustion safeguards. 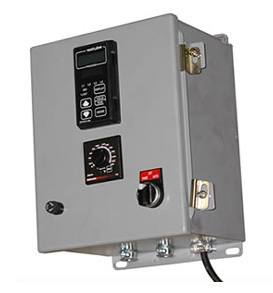 Control comes in a NEMA 12/13 steel enclosure with hand (manual), off, or auto selector switch, fuse, 5″ plug-in cord, type “K” thermocouple sensor, 10 feet of sensor wire, and 10 feet of output wire. Control set with 12″ straight duplex thermocouple with ceramic protection tube (for ovens, kilns, or furnaces) base list price is $2,520. Control set with 18″ x 18″ angle duplex type “k” 446 stainless steel protection tube (for tanks, melting furnaces, and molten salt bath furnaces) base list price $2,919.